Objective: The aim of this study was to evaluate the awareness and perception of general educated Indian individuals about Doctor of Pharmacy course. Methods: A cross-sectional structured Pharm.D questionnaire survey was conducted at educational institutions of India mainly through e-mails. Pharm.D questionnaire survey was conducted over a period of six months. The questionnaire was classified into four major categories, including course-related questions, roles-related questions, critical comparative questions, and opinion-based questions. The responses were collected and analyzed to assess the opinions and attitudes of the study population regarding the course Pharm.D. Findings: Out of 2819 responses, 66.01% agreed that Indian syllabus, teaching procedure, and hospital training in institutions are enough to prepare an ideally graduated Pharm.D. Respondents of about 70.59% agreed that Pharm.Ds should take care of complete responsibility of drug therapy rather than physicians prescribing the medications and Pharm.Ds fixing the dose. 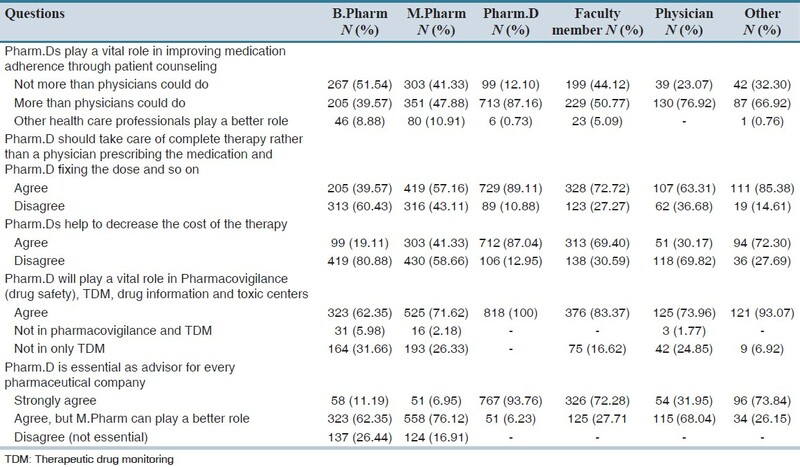 The statement "Pharm.Ds play a vital role in improving medication adherence through patient counseling" was accepted by 47.80%, whereas 41.40% did not accept it as they felt that the Pharm.D's role in this regard is not more than the physician's role, and 10.80% suggested that other healthcare professionals would play a better role. Among all the respondents, 73.64% of the study population was found to be ready for giving equal credit and respect to Pharm.Ds as physicians. Conclusion: Our survey emphasizes on the opinion of educated people of having Pharm.Ds in both government and private hospitals to take care of complete therapy and for improving medication adherence. The main objectives behind the establishment of the course are to raise the standard of pharmacy profession in India in terms of pharmacy practices, and also making pharmacy degree acceptable in various countries across the world; and to provide patient care in cooperation with patients, prescribers, and other healthcare professionals based on their knowledge of therapeutics and evidence-based data, taking into consideration issues that are relevant to legal, ethical, social, economic, and professional pharmaceutical and clinical sciences that may have an impact on the therapeutic outcomes. The main objective of this survey was to evaluate the awareness and perception of selected educated individuals about Pharm.D course. A cross-sectional, structured Pharm.D questionnaire survey was conducted over a period of 6 months from November 2011 to April 2012 among selected educated individuals in India. Ethical approval was obtained from the Institution prior to initiation of the study. The structured Pharm.D questionnaire with open- and close-ended questions was designed for the purpose of data collection, i.e., to assess the opinion and attitude of the study population regarding the course Pharm.D. The study population comprised educated individuals including students with different degrees of pharmacy (B. Pharm and M. Pharm, Pharm.D, and Post-Baccalaureate Pharm.D), staff of various educational institutions in India, physicians, and others (e.g., parents, siblings, and relatives of Pharm.D students in India). The study population was also asked to inscribe the demographic information including age, gender, educational qualification, profession, and their place of living. The prepared questionnaire was distributed throughout India mainly through e-mail. The e-mail addresses of class representatives from every college were taken and the questionnaires were mailed to them. They were requested to pass it on to their classmates so that no student would miss the opportunity to express his/her views regarding Pharm.D. In some of the institutions, the faculty, students, and also their parents and relatives who often visited the college were provided with paper forms of the questionnaire. The responses from physicians were mainly received by personally meeting them during their leisure time. Social networking sites were also used to circulate the questionnaire, but only Pharma-based population responses were taken into the data analysis and consequent results. The responses were collected. The questionnaire mainly included questions on specialization courses needed for Pharm.D; their role in improving medication adherence, complete circle of therapy (including both prescribing the drugs and also fixing the doses), and reducing the cost of therapy; need of Pharm.D in every hospital, community and hospital pharmacy, pharmaceutical company, pharmacovigilance centers, therapeutic drug monitoring (TDM) centers, and drug information and toxic centers; need to increase the awareness about Pharm.D; ability of the students to play a good role by undertaking government jobs; whether Pharm.Ds should be given equal respect as physicians; whether the Pharm.Ds deserve the "Dr." designation before their name; what the study population suggests the Pharm.D students to opt after they complete their regular academic course; and ideas to find out major causes if there is failure of Pharm.D in future in India. A suitable, piloted, self-administered questionnaire was designed initially as a 30-item interviewer-administered questionnaire, using a combination of closed and open-ended questions. Prior to this study, the questionnaire was piloted and evaluated for its content validity using the method developed by Lynn M.  To test the content validity, three experts were selected. The panel of experts included Head of the Pharmacy Practice and Pharm.D department, a senior faculty of Pharmacy Practice, and a physician. These content experts were provided with a copy of the questionnaire, and the rationale and objective of the study were clearly explained. Few changes in the order and phrasing of the questions were made after discussion with the panel experts. The final questionnaire consisted of 16 questions, which were classified into 4 major groups: (i) course-related questions, (ii) roles-related questions, (iii) critical comparative questions, and (iv) opinion-based questions, designed specifically to answer the awareness about Pharm.D. The questionnaire was analyzed question-wise and its percentage value was calculated. The responses were collected and analyzed after dividing the study population into different groups depending on their place of living, their profession, and qualification. They were categorized as follows based on the place of living: Andhra Pradesh, Karnataka, Gujarat, Kerala, Maharashtra, and Tamil Nadu. Depending on the profession, they were categorized as B. Pharm, M. Pharm, Pharm.D, Pharm.D-Post Baccalaureate, faculty, physicians, and others (parents, relatives, and educated friends). Finally, they were categorized as follows based on their qualification: Graduates, postgraduates, and research scholars (Ph.D). A total of 2,819 responses were collected from various pharmaceutical institutions in India. Out of the total number of responses, the number of responses received from Andhra Pradesh were 1071 (38%), Karnataka 846 (30%), Tamil Nadu 645 (22.9%), Kerala 164 (5.5%), Maharashtra 79 (2.8%), and Gujarat 14 (0.5%). The number of responses by Pharm.D students were 818 (29%), 518 (17%), Master of Pharmacy students 733 (26%), Baccalaureate of Pharmacy students, faculty members of various colleges 451 (16%), physicians 169 (6%), and 130 (5%) from others. Out of the total responses received, 1861 (66.01%) disagreed and 958 (33.99%) agreed that Indian syllabus, teaching procedure, and hospital training in institutions are enough to produce a perfect Pharm.D. Respondents of 1553 (55.10%) agreed, whereas 956 (33.90%) suggested that specialization courses are required for Pharm.D in India only after the Pharm.D program gets well established in the country, and 310 (11%) disagreed that there is a need of specialization courses for Pharm.D. Complete details on course-related questions are summarized in [Table 1]. Among the questions related to roles of Pharm.D, 1990 (70.59%) agreed and 829 (29.41%) disagreed that Pharm.Ds should take care of complete therapy rather than physicians prescribing the medications and Pharm.Ds fixing the dose. In total, 1742 (61.79%) respondents agreed and 1077 (38.21%) disagreed that Pharm.Ds help to decrease the cost of the therapy. The statement "Pharm.Ds play a vital role in improving medication adherence through patient counseling" was accepted by 1347 (47.80%), whereas 1167 (41.40%) did not accept it as they felt that the Pharm.Ds' role in this regard is not more than the physicians' role, and 305 (10.8%) suggested that other healthcare professionals would play a better role. Further information is furnished in [Table 2]. Among the questions related to comparison of Pharm.Ds with the physicians, 2076 (73.64%) of the study population were found to be ready to give equal credit and respect to Pharm.Ds as physicians, whereas 771 (27.36%) disagreed to do so. A total of 1663 (59%) agreed that Pharm.Ds deserve the "doctor" designation and 1156 (41%) disagreed the statement. Further details on comparative questions are discussed in [Table 3]. 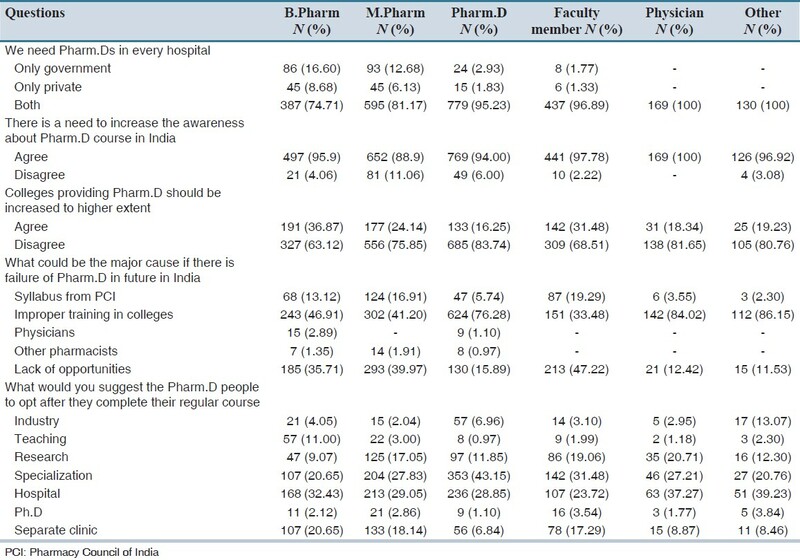 Assessing the opinion of the study population, it was found that 2388 (84.71%) agreed and 431 (15.29%) disagreed that there is a need to increase awareness about Pharm.D course in India. A total of 1105 (39.2%) respondents agreed that the colleges providing Pharm.D should be increased in number and 1714 (60.80%) disagreed as it may dilute the standards of the course. Among all, some suggested that the major cause of failure of Pharm.D program in future in India can be due to syllabus from Pharmacy Council of India 539 (19.12%), improper training in colleges 899 (31.90%), physicians 113 (4%), other pharmacists 28 (1%), and lack of opportunities 1240 (43.98%). Other details are listed in [Table 4]. Most of the respondents gave a positive feedback agreeing that there is a need of specialization courses for Pharm.Ds in India, in order to provide better and appropriate services to the needy patients; but few disagreed to the statement because they felt that if the basic course itself is not going to have a good boom, then what is the need for a specialization course. Hence, they think that the specialization courses should be introduced only after the achievement of proper establishment of the basic course. They also opined that it is a highly difficult task for PCI to introduce specialization courses immediately after setting up a new course. But most of the students are likely toward having the specializations. Majority of the respondents felt that Pharm.Ds are more vital than physicians in improving medication adherence through patient counseling because of many reasons: (i) physicians having insufficient time to counsel the patient, (ii) unfamiliarity of few physicians with the native/local language, (iii) inability of patients to understand the terminologies used by physicians, (iv) fear of patients in asking the physician to clarify doubts regarding their disease condition or about the drugs being prescribed, and (v) misunderstanding or improper understanding of patients' mentality by physicians due to lack of time. However, some of the respondents felt that Pharm.Ds cannot be more vital than physicians. The prime reason would be the admirable value that has already set in the minds of the patients toward the physicians. Indians show immense respect toward physicians and feel comfortable and safe when they are with the physicians than with the pharmacists. By this survey, the opinion of majority of the respondents to have Pharm.Ds who will take care of complete therapy was very clear. The main basis for this opinion of the study population is that they believe Pharm.Ds are expert in the issues related to drugs and physicians are experts in diagnosing the disease. In fact, many said that if Pharm.Ds are given the right to take care over complete therapy, then they will be helpful in reducing the cost of the therapy. Some respondents who think it is inappropriate to handover complete therapy to the Pharm.Ds did not agree that Pharm.Ds can help to reduce the cost of therapy, because according to them when the Pharm.Ds do not have the right to prescribe the medications, how can they be helpful in reducing the cost of therapy. So, the basic point is that the respondents who desire Pharm.Ds to take care of complete therapy also have an opinion that they will be helpful in reducing the cost of therapy by means of rational drug usage or so on. But very few respondents thought it is practically impossible to reduce the cost of therapy even if the Pharm.Ds are given the right to take care of complete therapy, because they cannot avoid any drug or multidrug therapy that is essential for the recovery of patients although it is costlier. Most of the respondents honor Pharm.Ds equally as they do the physicians because they knew the fact that to acquire a high quality of care for patients, there should be an equal involvement of both the physicians and the pharmacists; i.e., both have equal and significant role. So they show similar respect toward Pharm.Ds and physicians. A very minute percentage of the study population disagreed to show equal respect toward physicians and pharmacists because they always felt that the physicians are the supreme leaders in total healthcare system and they are to be honored with a high level of respect when compared to other healthcare professionals. There is a controversial opinion regarding increasing the number of colleges providing Pharm.D. Some advised that if the colleges providing Pharm.D are increased to a higher extent, then this will definitely lead to dilution of the standards of the course, and if the standards of Pharm.D are not really met, then that will ultimately lead to the failure of the course, which would be the worst scenario. So, in order to avoid this kind of troublesome situation, it is better not to increase the number of colleges providing this course. Few respondents had come up with different opinions saying that the society right now is in need of Pharm.Ds and in order to allot at least one Pharm.D in each hospital, there should be more students when compared to the present number. So, if the number of colleges providing the course is increased, then the number of Pharm.Ds coming out will also increase, and thus Pharm.Ds will be available in every hospital. This survey emphasizes on the opinion of educated people regarding having Pharm.Ds in both government and private hospitals to take care of complete therapy, to decrease the cost of therapy, and to improve medication adherence. It also states that there is a dire need to increase awareness about Pharm.D course in India and to have Pharm.Ds in every pharmaceutical company and research laboratory to ensure safety and efficiency. Thus, Indian syllabus, teaching procedure, and hospital training at the institutions must be improved in order to meet the Western standards; specialization courses should be introduced; and better emerging opportunities should be provided to assure the success and bright future for Pharm.D in India. This study had three important limitations. First, we were unable to circulate the questionnaire to every pharmacy student all over India. Second, we could not interact with most respondents personally as we e-mailed the questionnaire to them and received the response through the same. Third, we could not include community pharmacists in our study. The respondents suggested that Pharm.Ds should not be limited to hospitals but also enter into government jobs, such as drug inspector, and offer their services by playing a vital role. The respondents want Pharm.Ds to compete with others in all platforms of profession and achieve great success. Some of the respondents after coming to know all the roles of the Pharm.Ds wanted them in all the community and hospital pharmacies so as to provide maximum health care by reducing the chances of misuse of drugs and improving medication adherence and appropriate usage of over-the-counter drugs. The study population also suggested the dire need of increasing awareness about the Pharm.D course among all the individuals in India, and this can be done by conducting conferences, local meetings, and awareness programs across the country. The respondents assured that the Pharm.Ds have a very bright future in India if they are up to the standards they are supposed to be. Therefore, we recommend that several such studies of similar kind should be conducted to develop strategies to improve the awareness of Pharm.D program in India. We hope that the suggestions of the respondents will be considered by the higher authorities in order to raise the standards of the course and make it well established in India. We thank all the respondents who participated in the survey. Our deepest thanks to the panel of experts and also we extend our gratitude to our friends and faculty at St. Peter's Institute of Pharmaceutical Sciences for their constant support and encouragement. 1. Mateti UV, Anantha NN. Doctor of pharmacy in India: Scope and professional challenges. J Pharm Res 2011;10:97-101. 2. Deshpande PR, Farooq KK, John DM, Rao EJ. Pharm D: A new concept in India. J Pharm Bioallied Sci 2012;4:84-6. 3. Frequently asked questions about PharmD. Available from: http://www.pci.nic.in/PDF-Files/question.PDF. [Last cited on 2011 Mar 13]. 4. Pharm.D Course-Clarification regarding nomenclature of Pharm.D/Pharm.D (Post Baccalaureate) on pass certificates. Available from: http://www.pci.nic.in/PolicyCirculars/Circulars.aspx. [Last cited on 2012 Feb 18]. 5. Lynn M. Determination and quantification of content validity. Nurs Res 1986;35:382-5. 6. Bock LM, Duong MT, Williams JS. Enhancing clinical services by using pharmacy students during advanced experiential rotations. Am J Health Syst Pharm 2008;65:566-9. 7. Pham DQ. Evaluating the impact of clinical interventions by PharmD students on internal medicine clerkships: The results of a 3 year study. Ann Pharmacother 2006;40:1541-5. 8. Mateti UV, Rajesh, V, Laddha A, Sharma S, Anantha NN. Activities of Pharm D students in Indian Hospital. Pharma Rev 2011;7:133-4. 9. Chisholm MA, Hawkins DW, Taylor AT. Providing pharmaceutical care: Are pharmacy students beneficial to patients? Hosp Pharm 1997;32:371-3. 10. Clinical pharmacists improve patient care and help hospitals to treat more patients. The society of hospital pharmacists of Australia, 2011. Available from: http://www.shpa.rentsoft.biz/lib/pdf/whatsnew/cpis-final.pdf. [Last cited on 2012 Jan 10]. 11. Micheal D, Antun D, Margaret C, Sylvia C, Galbraith K, Matthews H. SHPA Standards of Practice for Clinical Pharmacy. J Pharm Pract Res 2005;35:122-46. 12. Pharm. D. Regulations 2008. The Gazette of India, No.19, Part III, Section 4. Ministry of Health and Family Welfare (Pharmacy Council of India) New Delhi, 10 th May, 2008. p. 1-97. Available from: http://www.pci.nic.in/PDF-Files/PharmD-Revised-A.pdf. [Last cited on 2012 Mar 27]. 1 indian pharm. d: should it be pursued?